Oh, the beauty of all women can be epitomized if their necklines are centered with a diamond Pendant. The best way to describe pendants is an ornament that is strung to chain and worn around the neck. They are a delicate piece of jewelry which is perfect for any occasion- grand or personal- and every type of dress- glamorous, bold or conservative. 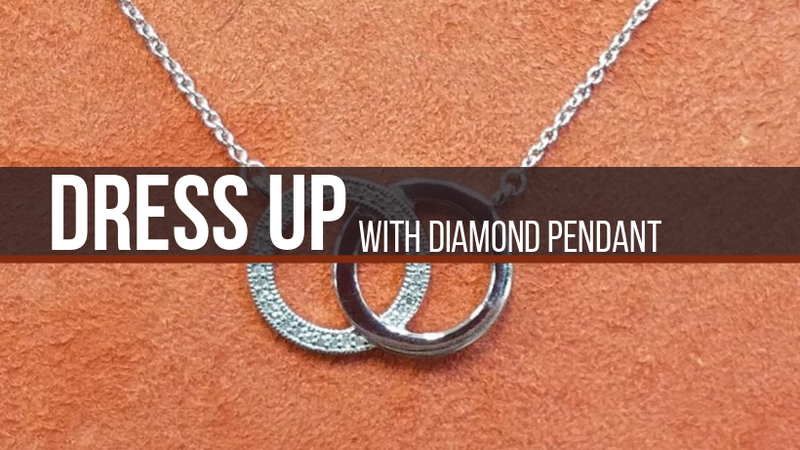 We have come up with three ways that you will make you stand out from the crowd just by styling your pendant right. Read, to change your life! The age-old KISS rule never fails and, yet, again stands fearless against the idea of extravagance. Diamonds never go out of style but if you wear a loud piece around your neck, it will not just take away the attention of your overall look but also make you look a lot classy. Diamonds are a girl’s best friend for a reason, after all. Whenever you wear a dress or a blouse or a top, know what type of neckline it is and how you can make it look better. It is usually thought that wearing a piece of jewelry is going over board for even small occasions. That is a myth. In fact, Diamond Pendants are the best when it comes to accessorizing. You can choose delicate, studded one with a bold dress of a revealing neckline. This works for the dress, the pendant and your intention to outshine. Vintage is one of our favorite styles for diamond pendants. They have the capability to be worn with all types of dresses as they supremely designed. The poplar design of pendants are the floral settings with solitaires in the center or multiple similar sized diamonds and a colored gem stone for attraction.